In order to support the tele-operation of drone, a new devise that can be controlled easily and intuitively, is proposed. The proposed devise also can display the feedback information from drone by tactile display, and it employs two visualization modes, first one is to display the difference between the drone’s direction and control direction by using the position of violators. Second one is to display the difference between the drone’s direction and control direction by using various frequencies. Through the experimental comparisons, the effectiveness of the proposed system is confirmed. T. Sugiura, R. Shimomura, and H. Nobuhara, “Proposal on Drone Control Device with Tactile Display,” J. Adv. Comput. Intell. Intell. Inform., Vol.22, No.3, pp. 341-350, 2018. T. Tanzi et al., “UAVs for humanitarian missions: Autonomy and reliability,” IEEE Global Humanitarian Technology Conf., pp. 271-278, 2014. 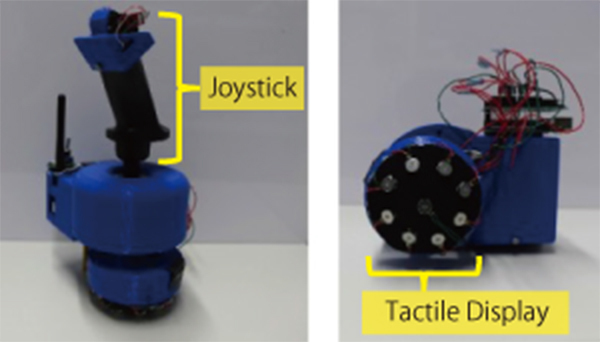 T. Kamegawa et al., “Development of the snake-like rescue robot ‘kohga’,” IEEE Int. Conf. on Robotics and Automation, Vol.5, pp. 5081-5086, 2004. E. Ackerman, “Drone adventures uses UAVs to help make the world a better place,” IEEE Spectrum, 2013. U. Ozdemir et al., “Design of a commercial hybrid VTOL UAV system,” Int. Conf. on Unmanned Aircraft Systems, pp. 214-220, 2013. D. Jenkins and B. Vasigh, “The economic impact of unmanned aircraft systems integration in the united states,” Association for Unmanned Vehicle Systems Int. Economic Report, 2013. W. Giang, “Baseline and Multimodal UAV GCS Interface Design,” Contract Report, DRDC-RDDC-2014-C128, 2011. H. T. Massie and K. J. Salisbury, “The phantom haptic interface: A device for probing virtual objects,” Proc. of the ASME Winter Annual Meeting, Symp. on Haptic Interfaces for Virtual Environment and Teleoperator Systems, 1994. P. Stegagno et al., “A semi-autonomous uav platform for indoor remote operation with visual and haptic feedback,” IEEE Int. Conf. on Robotics and Automation, pp. 3862-3869, 2014. H. Ichikawa et al., “Visual Impairment and its Alternative Technology,” The University of Nagoya Press, 2000 (in Japanese). Y. Shimizu, “Study on alternate transmission method of visual information by tactile sense,” Ph.D. Thesis, Waseda University, 1982 (in Japanese). J. Erp, H. Veltman, and H. Veen, “A tactile cockpit instrument to support altitude control,” Proc. of the Human Factors and Ergonomics Society 47th Annual Meeting, pp. 114-118, 2003. C. J. Stevens and K. K. Choo, “Spatial acuity of the body surface over the life span,” Somatosensory and Motor Reserch, Vol.13, pp. 153-166, 1996.